Scientists are planning to expand its knowledge about the big asteroid Bennu and asteroids in general thanks to NASA’s asteroid-sampling spacecraft, that is slowly but steadily approaching the final destination of its two year journey to deep space. The final approach of NASA’s asteroid-sampling spacecraft toward asteroid Bennu began on Friday, Aug. 17. NASA’s officials posted a tweet on OSIRIS-REx spacecraft’s Twitter account. “Today, after a nearly two-year journey, I begin Asteroid Operations and my final approach towards Bennu! #AreWeThereYet.” NASA officials tweeted. Nevertheless, be patient, as studying the big asteroid Bennu won’t begin just yet. OSIRIS-REx is still about 1.2 million miles (2 million kilometers) away from Bennu. It is estimated that the space probe will arrive in its orbit around the roughly 1,650-foot-wide (500 meters) asteroid about Dec. 3. The whole project is quite expensive, but it is likely the cost is worth paying to learn more about these massive space rocks that could jeopardize life on Earth if it were to crash into our atmosphere. The OSIRIS-REx mission cost $800 million, and its interesting name is short for Origins, Spectral Interpretation, Resource Identification, Security, Regoliath Explorer. The mission launched on Sept. 8, 2016 at the Cape Canaveral Air Force Station in Florida. NASA’s asteroid-sampling spacecraft will study the big asteroid Bennu from orbit, if it arrives as designed. It will collect a great variety of data, while also grabbing a large sample of the asteroid before finishing the mission in March 2021. The sample of the asteroid will come back to Earth in a specially designed return capsule in September 2023. An international team of scientists will gather to study the sample in order to help figure out the secrets of the solar system’s early history and evolution. Bennu is one of the carbon-rich asteroids, which are thought to be responsible for bringing life’s building blocks responsible for even life on Earth. Life’s building blocks are organic compounds like amino acids that are present on Earth now, as well as a lot of water. That said, a physical sample of Bennu can help scientists understand the history of life on Earth. Bennu is also a potentially dangerous asteroid which could dangerously approach our planet or even hit it in 2135. The OSIRIS-REx mission is additionally useful for that reason, because it can reveal the physical composition and structure of the rock and help humanity defend itself if it came to the aforementioned scenario. 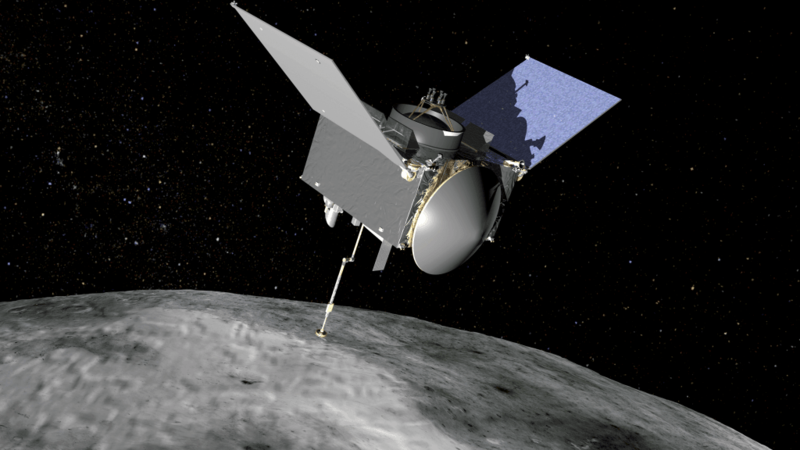 Also, according to a press release, NASA will host a media conference at 2 p.m. EDT on August 24, where it will update the media about OSIRIS-REx endeavors in space and sampling of the big Asteroid Bennu. “NASA will host a media teleconference at 2 p.m. EDT Friday, Aug. 24, to provide an update on upcoming activities related to the agency’s first mission to return a sample of an asteroid to Earth,” NASA said in a press release. OSIRIS-REx is not the only asteroid-sampling spacecraft right now. In June, Japan’s Hayabusa2 spacecraft reached its orbit around the near-Earth asteroid Ryugu. JAXA’s spacecraft will also grab samples, which would come back to Earth in late 2020. If nothing else, it’s a great time to study giant space rocks and learn more about them, and then use that knowledge for future space expeditions or even for making necessary protection measures against those space rocks.